Casa Heather is a very spacious 4 bedroom villa with 3 bathrooms, well furnished and equipped with everything needed for a relaxing holiday. There are two master bedrooms, each with a king-size bed, one with its own bathroom and access to the roof sun terrace with spectacular mountain views and the other with a large en-suite shower room. Three of the bedrooms have air conditioning; the fourth has an electric fan. Outside the large garden has plenty of patio area for sunbathing, comfortable sun beds, a built-in bar style barbecue, outside lighting, table and chairs for alfresco dinning and off-road parking for two cars. 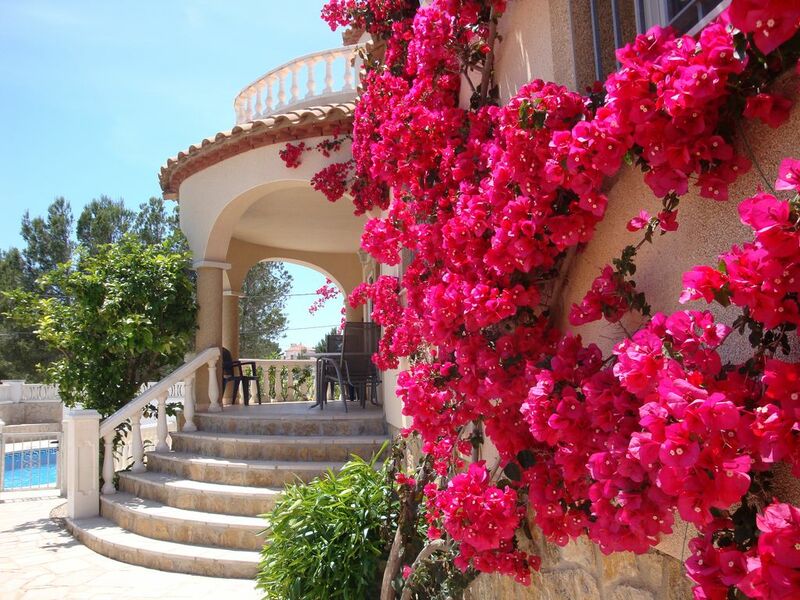 Mature bougainvilleas provide plenty of colour and there is a lemon tree and other shrubs. The swimming pool is protected by a balustrade wall with lockable gates to make the garden much safer for small children. A 'Guest Manual' is provided giving plenty of information about the villa, places of interest in the surrounding area, local shopping and restaurants. PortAventura World, an entertainment resort comprising of three parks; PortAventura Park, Caribe Aquatic Park and the newly opened Ferrari Land is only 25 minutes away by car or train. There are air conditioning units in the open plan lounge, both master bedrooms and one of the twin bedrooms. The other bedroom has an electric fan. The air conditioning units switch over to heating mode and oil filled electric radiators are supplied when necessary. Bed linen is provided for the duration of your stay. There is off-road parking for at least 2 cars. Bath and hand towels are provided for the duration of your stay. Open plan living room with seating for 6 people, extending dining table with 8 chairs. Well equipped with ample cooking utensils, variety of baking/serving dishes and plenty of crockery, cutlery and glasses. Modern fitted kitchen with cooker, hob, fridge freezer, microwave, dishwasher, toaster and coffee machine. Extending dining table with 8 chairs. Highchairs can be provided by prior arrangement. We have BBC and ITV HD channels via satellite but, as the satellite signal could be altered at any time and this is totally beyond our control, the provision of these channels is not guaranteed. Large selection of English books for adults and children. Plenty of board games for all ages. The garden has mature, colourful bougainvillea, a lemon tree and other attractive shrubs. There is a large sun terrace, accessed through the upstairs master bedroom, with impressive views of the nearby moutains. The impressive Golf Club de Bonmont, considered to be one of the finest golf courses in Catalonia, is just a 20 minutes drive from Las Tres Cales and there are other courses in the near vicinity. Utility Room: There is a large utility room housing the washing machine, with plenty of space for storing cases etc. This stunning villa in a private residential area exceeded our expectations. The villa is stunning, spacious clean , all the amenities you could need including wifi and an information pack . Outside the pool area is secluded and private and we used it every day. The views from the roof terrace of the mountains were a lovely . We walked to the local shops every day and to Bambalinas a friendly local restaurant most evenings . Very well equipped, comfortable beds, everything was available to make a wonderful stay. The villa is very well maintained, and well presented. Myself and a group of four friends (ages 22-25) visited Casa Heather this summer for a luxurious getaway in the sun - we definitely got what we came for. We flew in to Barcelona in the morning and picked up the car rental from the airport, making our way to L'Ametlla de Mar and les Tres Cales that day (only 1.5hrs drive via toll route). Stopping off at the local Mercadonna to buy our weeks' worth of food (and drink) - this being only a 10 minute drive away, but there are local shops closer to the villa. Upon arrival I was impressed by the upkeep and maintenance of the interior and exterior of the villa, it is an impressive build placed on the corner of the estate ensuring our holiday was quiet, safe and private for the duration. We never felt overlooked or at risk throughout our break as we lounged around the pool with music. No need to pull straws when deciding rooms either as each of them were really inviting - all clean, comfortable and spacious with plenty of bathroom space (there are 3!) to spread ourselves out for the week. For the most part of our week we spent at the villa and the surrounding estate. The villa is perfect for alfresco dining as we often had breakfast, lunch and dinner sat on the terrace, by the barbeque or near the pool. We made good use of the comfortable sun-loungers (and plenty of books) provided. The pool area is a good sun-trap and you can enjoy sun from dawn until 9/10pm, however, it was easy for some of us to take a break from the sun and remain outside when sitting on the terrace. There was a good selection of DVD's, books and board games available to keep us entertained in the evenings (on top of some home-made Sangria). We spent a couple of evenings out at local restaurants Bambalina and Hotel Llorca as informed by the detailed Guest Manual and we weren't disappointed by the food and service - the seafood Paella is a must! We opted for a car rental to allow easy travel to local destinations. This made it very easy to go to Almadrava Beach (10 minute drive) one day and PortAventura Park another (30 minutes). The Caribe Aquatic Park was a really good choice for a day out and we all felt like big kids with the impressive, and somewhat daunting, water slides. Our final day was spent in Barcelona where we enjoyed a free walking tour of the city and saw the sites of Las Rambla and Placa de Catalunya - I recommend visiting the bars and restaurants on Placa Reial. Overall, the entire holiday was really memorable for all of us! beautiful pool and outdoor space. Had a lovely stay for 1 week in may. Villa had everything we needed, except perhaps wifi, which was a bit intermittent. Pool was very clean, but sadly too cold for us to use as our weather was not great. Great BBQ area and dining space and lovely rooftop terrace. Nice beaches nearby. Thanks for the tips on visiting Peniscola and Miravet. Both well worth the visit. Very quiet area, nice walks from villa. Thank you for your review, we are very pleased you enjoyed your stay at Casa Heather. For information, we subsequently found out there was a fault with the wifi router. This has been replaced and at the same time we had the signal upgraded to give a better line speed, so the wifi should be much more reliable in the future. This is a lovely, bright, spacious villa and one of the best equipped we have stayed in. The beds were really comfortable and everything was clean. Spent most of our time relaxing around the villa and good sized pool. The walled terrace area is quite private and great for sunbathing and nicely lit up in the evenings for outside dining/barbecues. Tres Cales is a quiet urbanization and the local beaches are a short drive on quiet roads. We particularly enjoyed Cala Jordi and Cala Forn which have nice beach bars and safe, sandy, protected swimming. L'Ametlla de Mar is a pleasant and very Spanish fishing town with good choice of restaurants - particularly good for fish! There is a restaurant on the estate, Bambalinas, about 15 minutes walk, and we enjoyed a nice meal here on a couple of occcasions. Overall a very relaxing, enjoyable holiday and would recommend and definitely visit again. Our party of 7 found the villa very spacious and had everything we needed to make it a very comfortable stay. It is located at the far end of Tres Cales which was nice and quiet. Our food pack that we ordered unfortunately wasn't there when we arrived after midnight so we had nothing to eat or drink until the following morning when we went shopping. This caused some discontent initially. The pool is lovely and the terrace meant that we could stay out of the sun when we wanted. Only difficulty we had was the location which despite excellent instructions , we found the grid confusing and took some time finding our way home until at least day 3! It took us 45 minutes to get to the supermarket on the estate, but to be honest I think that was just us! It's only 5 minutes by car if you go the right way. Beaches at Amellta were not nice but it is more of a fishing port. We found a great one at L'almadevra and the coves/ creeks were good fun if you're a strong swimmer. Good choice of restaurants in Amellta. There is an excellent folder in the villa with lots of really useful info and recommendations. Make sure you make a reservation at the restaurant as we were turned away at the one on the estate on the first night but luckily found a takeaway pizza flyer in the post box...excellent pizzas and fast delivery even at 11.30 pm! Peniscola worth a visit but over a 1 hour drive..take the auto piste rather than the N340 as this reduces the time substantially and a lot less lorries! All in all a lovely week in a lovely villa. Ryan air fly into Reus and both Ryan Air and Easy Jet have a frequent service to Barcelona. Thompson Airways operate charter flights to Reus from May to October from selected regional airports, including Bristol, Gatwick, Manchester and Newcastle. Ryan Air also fly from Stansted to Castellón. Jet2 fly from East Midlands to Reus. Reus is only a 25 minute drive from the villa, while Barcelona is just under 90 minutes. A car is recommended to best enjoy the area and for easy transfer. The nearest railway station is at L’Ametlla de Mar, with a direct line to Barcelona. The villa is situated on the quiet estate of Tres Cales. There is a bar/restaurant next to a children's playground within 15 minutes walk and a small supermarket, bakery, tapas bar and restaurant at the entrance to the estate, 25 minutes walk from the villa. The traditional fishing town of L'Ametlla de Mar is just over 5 minutes by car (4km) and has a good selection of shops, harbour side bars and restaurants. There is a large Mercadona Supermarket with plenty of parking 5 minutes drive from the villa. There are three Blue Flag sandy beaches within 5 minutes drive and there are many other lovely beaches and coves to discover nearby. This area has some of the most beautiful, undeveloped coastline on the Mediterranean and none of the beaches are crowded, even in July and August. Barcelona, the European city of culture, 90 minutes away by road or two hours by train, is a truly fascinating city to visit. PortAventura World, an entertainment resort comprising of three parks; PortAventura Park, Caribe Aquatic Park and the newly opened Ferrari Land, is situated at Salou, a lively tourist resort approximately 25 minutes by car. The historic cities of Reus and Tarragona, with its impressive Roman buildings and amphitheatre, are 30 minutes drive away. Towards the South is the Ebro Delta Natural Park, famous for its pink flamingo’s, rare species of birds and monstrous catfish. This is a haven for fishermen and fishing is permitted along the public areas of the River Ebro, although a fishing licence must be purchased from the local village town hall. The medieval town of Peñíscola, one of the locations where the epic film El Cid was shot, is 85km to the south and also well worth a visit. If you venture inland you will discover beautiful mountain scenery and remote villages. A 'guest manual' is provided at the villa giving comprehensive details of places to visit in the area, local restaurants and facilities. ALL OUR PRICES ARE INCLUSIVE OF SPANISH TOURIST TAX, WI-FI, END CLEANING AND LAUNDRY. There is a pet fee of £50. Rates are subject to change until the reservation is confirmed. TOUS NOS TARIFS INCLUS DE TAXE TOURISTIQUE ESPAGNOLE, WI-FI, FIN NETTOYAGE ET LAVERIE. Les frais pour animaux de compagnie s'élèvent à 50 £. Les tarifs sont sujets à changement jusqu'à la confirmation de la réservation.